Access to clean, safe, and affordable water is a fundamental human right essential for a healthy population, environment, and economy. In spite of the fact that California has the sixth largest economy in the world, millions of Californians lack a safe supply of drinking water. Thousands more fish in polluted lakes and streams, swim at sewage-contaminated beaches, and live in the path of polluted floodwaters. Most are people of color and low-income people. This chronic lack of access to water is an environmental injustice, part of a much larger reality of environmental discrimination experienced by people of color and low-income communities in California. Environmental discrimination occurs when corporate or government policies deny low-income communities and communities of color equitable access to the ecological, social, economic or political resources necessary to their health and prosperity. Government inaction and lack of enforcement of existing laws are also a form of environmental discrimination. California's water problems do not stem from too little water, but rather from greed, racism, and exclusion. Every aspect of the state's enormous water infrastructure -- from how the water flows from river to faucet and irrigation ditch, to how agriculture, industry, and cities pollute waterways -- is influenced by political structures that systematically exclude the diverse needs of California's low-income, communities of color. Gold Rush mining monopolies and early agricultural empires crafted water codes that consolidated elite, white control of rivers and aquifers. People of color were marginalized economically and systematically excluded from the process of deciding who gets to use water resources, and how water is used. California's racist and exclusionary water policy has resulted in a complicated, fragmented system of water control and regulation, or water governance. The confusing web of water districts, agencies, and corporations that currently controls water prevents many community members from participating in decisions about their water. The regulatory agencies that are charged with ensuring that all Californians have access to safe, affordable water and can participate in decision-making processes have repeatedly failed to address community concerns. The cumulative result is a series of health and environmental concerns that overwhelmingly impact the quality of life in low-income communities and communities of color. If institutionalized racism and entrenched injustices are not acknowledged and addressed, emerging technological and management fixes will only increase the current water system's disproportionate economic, social, and health impacts on people of color and low-income people. Water justice requires a participatory system of water governance and new, community-based forms of management and regulation. The case studies that follow show how community environmental and health problems related to water fit into a pattern of discrimination embedded in water policy and management, and highlight some of the struggles, campaigns, and model projects communities are undertaking to address local water issues. We present community voices in the context of current and historical injustices to help develop a common language that impacted communities can use to articulate their concerns, values, and visions for California water. 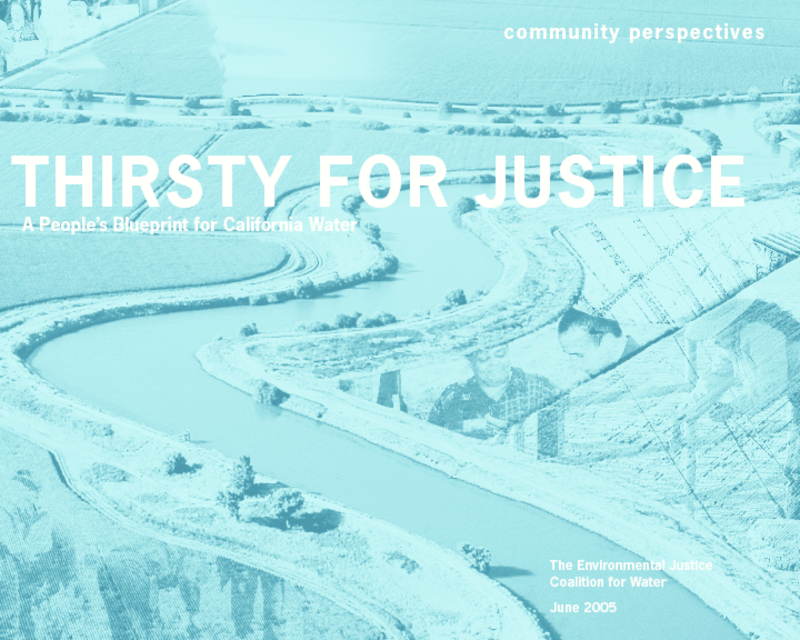 For a more detailed account of environmental injustices within California water policy, please see the full length report Thirsty for Justice: A People's Blueprint for California Water. Copyright 2005 Environmental Justice Coalition for Water, The. All rights reserved.